What a way to start the foaling season! 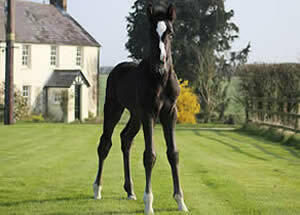 Our wonderful Elite mare Bugatti has done it again and given us another superb black colt this time by Dream Boy. Canter is definitely going to be his thing – that’s all he wants to do all day, along with learning new things, he is very confident boy and takes everything in his stride - he is a delight! We are thrilled with him and think he is going to be a serious dressage prospect and maybe even a stallion - he certainly has the bloodlines and the swagger! Sire Dream Boy ........,,,,,..,,,,,,,,.........,,,,,,,,,,,,...............,,,.....,.................,,.....BDam Elite Bugatti ST ..